The Satechi Type-C Headphone Jack Adapter also lets you charge your iPad Pro. Satechi just introduced an adapter for audiophiles with the new iPad Pro. There’s no headphone jack in this tablet, so this accessory maker created a USB-C-to-3.5mm adapter. Apple encourages its customers to use Bluetooth speakers and headphones, which is why there’s no 3.5mm headphone jack on many of its mobile devices. Those who aren’t willing to give up their wired headphones can turn to adapters, like the one Satechi created for devices with USB-C ports. The device that has the greatest need for this is the 2018 iPad Pro, as it has only a single port for charging, data and audio. Just a importantly, this aluminum adapter includes a USB-C port so the iPad Pro can still charge. This supports the Power Delivery (PD) standard so it can transfer current at up to 89W. Not that Apple’s tablet supports power at that wattage, but the accessory can be used with other computers, including recent MacBook Pro and MacBook Air models. The Satechi Type-C Headphone Jack Adapter is available now for $24.99. iPad Pro users who want a headphone jack plus many more ports should read our Satechi Alumiunium Type-C Mobile Pro Hub Review. Satechi’s headphone jack adapter along with its USB-C braided charging cable. 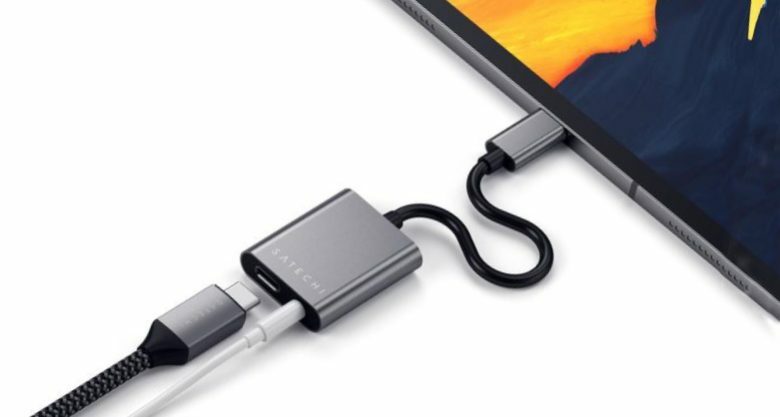 Too many USB-C cables can’t handle the full capabilities of this standard, but the Satechi promises its new USB-C charging cable can take data transfers at up to 480 Mbps. And the company put “100W” right in the name for fast charging. The cable is made of braided nylon to help prevent breakage, and there’s an integrated Velcro strap. The Satechi USB-C To USB-C 100W Charging Cable comes in at $19.99.